Milk chocolate banoffee & chilli truffles from Holdsworth Chocolates. 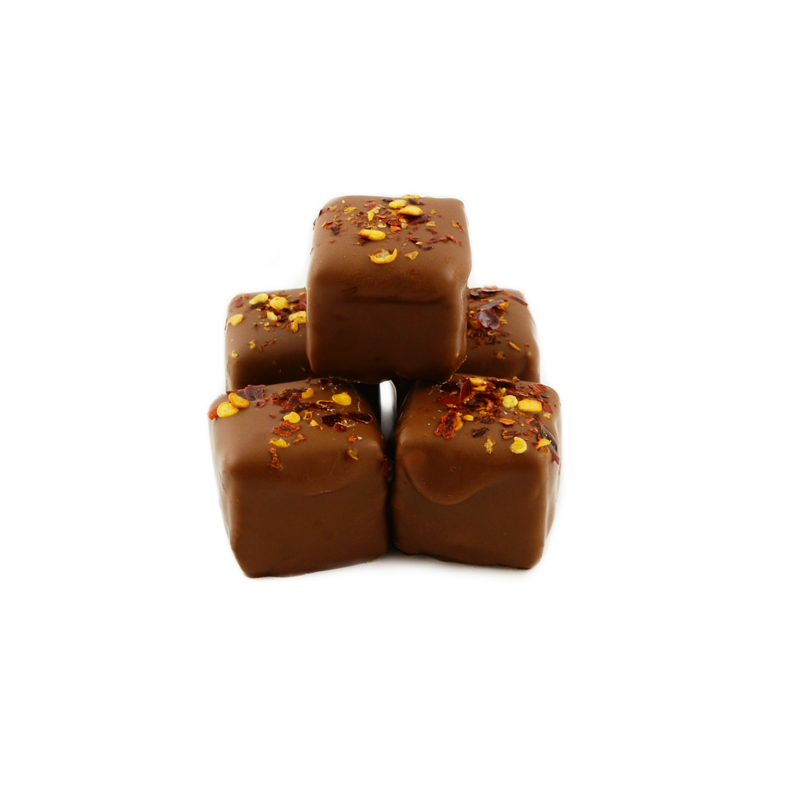 This unique banana, toffee and chilli ganache truffles, wrapped in fine 33% milk chocolate and finished with a sprinkle of chilli flakes. A hot sweet exotic treat. 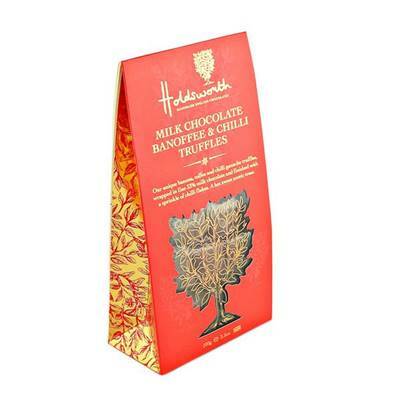 This gorgeous ‘Treat bag’ also comes in Marc de Champagne, Peanut butter caramel & Orange truffle – Click to view. Ingredients: Dark Chocolate (Cocoa Mass, Sugar, Cocoa Butter, Emulsifier: Soya Lecithin, Natural Vanilla), Milk Chocolate 33% (Sugar, Cocoa Butter, Whole Milk Powder, Cocoa Mass, Emulsifier: Soya Lecithin, Natural Vanilla), Fondant (Sugar, Glucose (Wheat), Water, Preservative: Sulphur Dioxide), Butter (Milk), Caramel 8% (Glucose Syrup, Sweetened Condensed Skimmed Milk, Sugar, Water, Cocoa Butter, Modified Starch, Thickener: Agar, Flavours, Emulsifier: E471-Sunflower Lecithin, Salt, Acidity Regulator: Citric Acid, Preservative: Potassium Sorbate), Banana Purée 0.5% (Glucose Syrup (Wheat), Invert Sugar Syrup, Banana Juice Concentrate, Ethanol, Natural Flavouring, Acidifier: Citric Acid, Colouring Plant Concentrates (Carrot, Pumpkin, Apple, Safflower, Lemon)), Salt Flakes, Chilli Flakes 0.2%.